Yuval Steinitz says Israel and France share concerns over US-led hasty deal with Iran, as he ends a 2-day special diplomatic mission. Israel's intelligence minister on Tuesday wrapped up a two-day European diplomatic offensive against making concessions to Iran in nuclear negotiations with world powers, his spokesman said. 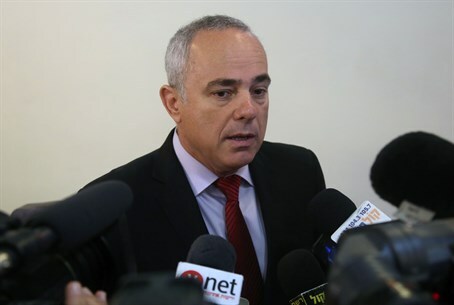 "Intelligence Minister Yuval Steinitz completed two days of intensive discussion in Paris and London," a statement from Eyal Basson said, adding that the minister was accompanied by National Security Adviser Yossi Cohen and "intelligence experts". "They met the British negotiating team, headed by Simon Gass, and senior intelligence officials," the statement said, adding that Steinitz in his meetings talked about Iranian research and development on advanced centrifuges. These highly sophisticated machines enrich uranium gas at supersonic speeds to make it suitable for power generation. At high purification levels it can also be used in an atomic bomb. Iran currently has about 19,000 centrifuges, of which just over 10,000 are operational. Steinitz said that a deal with Tehran should oblige it to reveal details about past experiments it has carried out in nuclear weapons technology, the statement said. It gave no details about the Israeli delegation's talks in Paris. But in an interview with French daily Le Monde, the Israeli minister warned against concluding a "bad accord" on Iran's nuclear program, saying his country shares France's wariness of trusting Tehran. "We believe it would be a bad accord with severe gaps in it," said Steinitz, who met French President Francois Hollande's diplomatic adviser on Monday. A statement on Sunday said that Steinitz was "on a mission from Prime Minister (Binyamin Netanyahu) for a short visit to Europe in an attempt to influence the details of the emerging agreement on the Iran nuclear issue". Netanyahu has repeatedly called for Iran's entire nuclear capability to be dismantled. Both France and Britain are members of the P5+1 group of powers in nuclear talks with Iran that are set to resume on Wednesday or Thursday in Switzerland. France has expressed skepticism about the speed of a potential deal in which Iran would place its nuclear program under severe restrictions in exchange for a stage-by-stage lifting of international sanctions. Netanyahu, who was elected to a third consecutive term last week in a close-fought general election, spoke to the US Congress during his campaign to denounce the agreement under negotiation as a "bad deal". "That deal will not prevent Iran from developing nuclear weapons," he told the US lawmakers. "It would all but guarantee that Iran gets those weapons, lots of them." Tehran and the world's major powers are facing a March 31 deadline to conclude a framework agreement to pare back Iran's nuclear program to ensure it can never build an atomic bomb. US Secretary of State John Kerry and his Iranian counterpart Mohammad Javad Zarif are scheduled to resume talks in Lausanne Thursday in a bid to beat this month's deadline for a deal that must be finalized by July. But as efforts to make sufficient progress to conclude a deal in time have picked up pace, divisions have appeared within the so-called P5+1 group made up of the UN Security Council permanent members the United States, Britain, China, France and Russia plus Germany. Paris in particular has expressed fears a rush to sign an agreement may grant Iran enough concessions for Tehran to cheat or otherwise pursue military nuclear development. During his visit, Steinitz echoed French concerns about an overly flexible deal. "We see things the same way France does. We have the same suspicions about Iran, its intentions in the Middle East and the possibility it will not respect the accord," Steinitz warned. "If Iran became a (nuclear) country, many Sunni nations in the region would join the nuclear race." "This is perhaps the last opportunity to influence these negotiations before a memorandum of understanding is signed," Steinitz said.